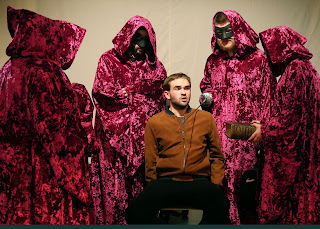 The Prince of Wales, a new play by Jon Tregenna, performed by Llanelli Stage Company and Llanelli Youth Theatre, Stiwdio Stepni at Ffwrnes Theatre, Llanelli. (running through to Saturday night, November 18). It’s got history, humour and high jinks. And the end result is slightly hysterical in a highly amusing way. The new play from Buggerall author Jon Tregenna is a fast-moving, cleverly-staged development of a radical idea. What if there is a descendant of the last great Welsh king, Llywelyn Ap Gruffudd? Will it be the end of the Prince of Wales, Prince Charles? Will it spark a constitutional crisis? There’s razor-sharp humour in sackloads played across a backdrop of serious themes about Welsh nationhood, friendship, mistaken identity, love, passion and the consumer culture. Throw in a few swipes about a pretentious arts and media culture and you have a bubbling Welsh cocktail which fizzes and delights through one long act with multiple scene changes. Carmarthen Male Voice Choir Côr Meibion Caerfyrddin will be holding their annual concert this weekend, 7.30pm on Saturday, November 18. Priody Chapel in Priory Street, Carmarthen, is the venue. The choir’s special guests include tenor Osian Wyn Bowen, Côr Merched Hyn Ysgol Bro Myrddin and organist Meirion Wynn Jones. On Sunday, November 19, there’s the annual Grand Concert at Myddfai Community Hall (7pm start). The concert will feature three combined choirs – Cwmann, Dinefwr and Llandovery. Soloists will be Tristan Lewis Deganwy (Llandudno), Ioan Wyn Parry (Dolgellau) and Mariwyn and Cadi Fflur. Proceeds from the event (tickets £10) go towards Llandovery Hospital League of Friends and Myddfai Community Hall. Côr Merched Curiad y Cwm ladies choir will be celebrating their 30th anniversary with a special concert at Tumble Hall at 7pm on Friday, November 24.